Tom Hawthorn's blog: Can the magical summer of '67 be revived? Four summers ago, Richard Barham returned to the site of a magical moment from his boyhood. He stood on a manufactured island in the middle of a mighty river, reflecting on a summer when the future seemed rich in possibility and a humble nation found voice in its centennial year. Mr. Barham remembered fanciful pavilions, the La Ronde amusement park, a monorail snaking above the fairgrounds, and a sleek, computer-controlled train shuttling between Montreal and the two smaller islands that were home to Expo 67. He stood near where the train had once stopped, at a square known as Place des Nations, back then lined by flagpoles flying a brilliant tapestry of colours for nations from around the globe. He contemplated the remnants of a world's fair that captured the popular imagination. Little remained of the glory days - a bit of signage and two pavilions transformed into a casino. He felt like he was standing amidst Greek ruins. Let's revive the spirit of the summer of 1967. Let's invite the world back to Montreal, where this time we would show off a green vision of the future. "This needs to happen again," Mr. Barham said. "There needs to be a ray of hope." Before lining up politicians, conducting engineering studies, or crunching numbers to offer a budget, Mr. Barham began researching the possibilities. Like a boy designing a utopia of his own, he produced a 51-page proposal for an event he calls Expo 17. He envisions a revitalization of Montreal's waterfront, some of which remains undeveloped - "a no-man's-land" - even 42 years after serving as parking lots for the original Expo. He sees pavilions built that can be reused after the fair closes its doors. He dreams of cleaning up the St. Lawrence River. He imagines Canada again taking its place on the world stage as "an inclusive and innovative nation, a caring people and an active guardian of the planet." It would be a heck of celebration to mark sesquicentennial celebrations for Canada's 150th birthday. The theme would be Earth, Fire, Water, Air, summed up by colouring the letters in Expo green, red, blue and yellow. As it turns out, it is not so easy selling a world's fair in Montreal from one's home in Gibsons. On the Sunshine Coast. In far-off British Columbia. Mr. Barham owns a small information technology company. 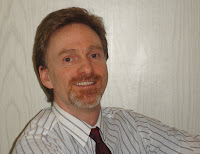 He has worked in electronics, communications and film production. He has lived in Montreal for only about six of his 51 years, but one of those was an unforgettable summer. "Somebody's got to do this," he insists. He first presented his proposal in Montreal two years ago on the 40th anniversary of the opening of Expo 67. The response was lukewarm. The mayor's office said another fair was not a priority. Some mixed up the costly overruns of the 1976 Olympic Games with the success of the world's fair. (The Olympic debt was only retired 27 months ago.) Some wondered why a guy from British Columbia was promoting a scheme for Quebec. 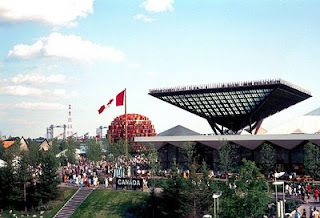 Expo 67 came in for criticism in its day. Montreal mayor Jean Drapeau's plans were too grandiose and too expensive. There was not enough time to build two islands. No one would come. All of that was forgotten once the doors opened. Mr. Barham was asked how he felt about the original Expo as a boy. "Enlightenment sounds too adult for a kid," he said. "Tremendous pride. Expo was like walking into a utopia. It was amazing. And it was amazing that the amazing had been constructed in Canada of all places." Something so grand - so visionary - seemed American. Instead, Canadians had to alter their idea of themselves. "What happened to that country? What happened to that image of ourselves?" Nor is Mr. Barham alone in his desire to play host to an expo on Canada's big birthday in 2017. Last October, Edmonton city council agreed to prepare a bid, while a lawyer in Hamilton, Ont., proposes Steeltown's west harbour as an ideal location to host a party for the world. Ottawa Mayor Larry O'Brien thinks the nation's capital would be a dandy place to hold an exposition. Others in Lille, France, and Salamanca, Spain, have also expressed interest, though the latter's bid will suffer as Zaragoza held an expo last summer in which water and sustainable development were the theme. The fair's mascot was a water droplet named Fluvi, who looked a lot like a tear. In Shanghai, the countdown clock shows 409 days until the doors open to Expo 2010. The winning bid will be determined by the Paris-based Bureau International des Expositions. For two years, the idea of Expo 17 has been "cruising on the backburner." The Expo 17 group, which includes Yves Jasmin, who won the Order of Canada for his work in publicizing Expo 67, has just about been disbanded. "Everyone's gone back to their day jobs," Mr. Barham acknowledges. On a sad note, his father, Bob Barham, who had been a consultant, died in Vancouver last month. The elder Mr. Barham had been project manager for the Expo Express train in 1967. The proposal includes a revived Expo Express running to downtown Montreal, while also linking with a seabus modelled on the ones crossing Burrard Inlet. These days, the Expo 17 group operates from a Commercial Drive post-office box in Vancouver. But he sees renewed opportunity in the financial crisis. Governments might decide to spend huge sums to keep the economy afloat. What better way than an environmentally sound exposition, perhaps combining horticulture with housing? They called Jean Drapeau a dreamer, too. Years later, they named a park on the Expo grounds after him. I lived in Montreal during Expo Summer and was obsessed with the fair as only a seven-year-old can be. My parents could only afford a one-day visit, so we packed a picnic lunch, took the Metro, and spent a wondrous summer day. I saw a Mercury capsule, watched the film "A Place to Stand" (the title song, known as ""Ontar-i-ar-i-ar-i-o," was composed by jingle writer Dolores Claman, who would write the "Hockey Night in Canada Theme" the next year), spoke to my mother on a video-telephone. John Whelan's photo collection of Expo 67 is a time machine back to a happy time. You can even listen to Bobby Gimby's "Ca-na-da." Or not. Thanks for a well-written and thoughtful post. As a kid in New York in the sixties, I was intrigued by things Canadian, and absolutely fascinated with Expo '67. It really did seem magical, and not commercial like so many undertakings in the US. Unfortunately I couldn't get my folks to take me to it (I was 11). Fast-forward to the mid-eighties. While living in Europe, I became friends with Rick Barham, and my appreciation for Canada and its culture deepened. A few years ago, when Rick told me about his vision for Expo '17, I thought, "Man, that has to catch on. Its brilliant, and the world would once again look to Canada as a major cultural leader." I couldn't wait. The plan had seen ups and downs, but it's got to succeed. As a US American, I'd love to see our northern brothers and sisters once again enjoy that great cultural leadership that inspired so many others. This is a vision that can move the world. And this time I will make sure I get to it!